My approach was totally different to that of a typical plasma physicists. I’m just an engineer and I was searching for a way to get fusion energy plants only by todays means. In my thinking I strictly didn’t allow hypothetical processes and methods, that have to be discovered first. I recognized that many of the fusion reaction problems are fundamentally controversially discussed in the scientific plasma community. I didn’t want to rely on future technologies, that many physicists think today, because of mathematic calculations, they will never work. I think I have found a practicable solution, now, that only relies on available fusion technology. I got the inspiration for my ideas basically from few informations of two partially military developments in the 50th and 60th of the 20th century that I merged with former ideas, that I had twenty years ago as a student, and with newest research results. So I got a new combination of available technologies that make fusion energy plants buildable right now. This sounds strange. I will show You, that this is possible. Because I was partly inspired by historic scientific projects, and because my ideas are only some unusual combinations of existing technologies and newest knowledges from some fields, that I participate like others through the international scientific community for free, I think I’m not entitled to claim anything for my ideas as an inventor. But I hope, by publishing this article in global public and in English language, to reach as many people as possible to hopefully stimulate a discussion of building fusion power plants right now. I will show You in the following text, that the solution for the problem of producing limetless, clean and cheap fusion energy actually was before our faces for the last fourty years. I will explain the three ideas that I merged and the final impulse that led me to the idea of the power plant, now. First, I was inspired by the Orion project, a bigger research project founded by ARPA, US Air Force and NASA between 1958 and 1965 . Orion was a project to develop a very big nuclear rocket, in concurrency to the smaller chemical Saturn V Moon rocket development . The latter was led by former German V2 Nazi scientists , who had a lot of experiences in building chemical rockets. In the Orion concept, there was no continuous burning of the propellants aspired but a discrete burning. Bombs where ignited behind the rocket, their forces were damped during the explosions. This damping was similar to the function of shock absorbers in a car when driving over a road hole at high speed. The Orion scientists built small test rockets with chemical loads that lifted off and flew quite good. There is a nice video on Youtube where you can watch how it works . The makers of the Orion project planned to change the chemical bombs soon with atomic bombs to become able of using their immense propulsion power to get thousands of tons of payload and hundreds of people in a few weeks to Mars. The physicist Ted Taylor , was the director of the Orion project. Freeman Dyson , professor emeritus at the IAS, Princeton, worked on the project from 1957 to 1961. His son, George Dyson, who was attending his father as a small boy, wrote a book about the Orion project  and its backgrounds. All people that have ever worked on this project and are still living say sentences like: You can think about Orion what you want, one thing is absolutely sure, it would have worked. I thought about his sentence very often, and yes, he was absolutely right: driving a car must be crazy! If you drive a car with 3000 rpm you can calculate that there are 6000 Explosions in a 4 cylinder motor per minute with a explosive force of 24 mg TNT each or of 18 hand grenades of 80 g TNT per minute. This is 36 hand grenades per minute at 6000 rpm – just one and a half meter in front of the drivers head. It seems to be a wonder that we normally survive this crazy ride. Sometime we do apparently crazy things but we are accustomed to it and so they become normality. These considerations actually gave me the final impulse for a fusion plant. But there were a second and a third precondition necessary. 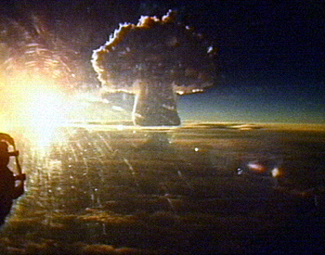 Second, there have been several developments in the 50th and 60th to find peaceful applications for atomic bombs. There was a bigger project in the 60th, it’s name was PLOWSHARE  that was meant to join the knowledges of several „smaller“ projects like RAINIER, NEPTUN, GNOME, CHARIOT, OILSAND, etc.   . Each of these projects were nuclear test explosions to explore several aspects of usability for practical goals, e.g. like blasting big caves beneath the surface for storing freshwater or oil, building dams by nuclear explosions, blasting lanes through mountains to build railroads without the need of expensive tunnels, making port basins of new harbours out of the shore, make geothermal energy cost efficient by perforating the bedrock, and other stuff that can be subsumed with the modern term Terraforming or Geoengineering Technologies. The most interesting project to me was GNOME that investigated the use of nuclear bombs for energy production. But these technologies were very dangerous, they could have triggered major earthquakes, and there were big problems with radioactive contamination of the general public and with the stability of artificial underground caves.. The partial nuclear test ban treaty  stoped theses developments of using nuclear bombs for peaceful purposes, too. Third, for about 20 years, since I started to study rocket science, and electronics, I had those ideas of bringing nuclear power reactors on the Lunar surface and operate them on the edge. They should work without any containment, the bare naked core in white heat. They should liquify their Uranium with intent and not by accident, to make them much more efficient. If they explode, no problem, take the caterpillar, sweep up the debris, which flew off on exactly computable ballistical vacuum trajectories. Sweep the debris up to a pile and build a new reactor 50 meters aside. I learned to solve the problem of transporting the energy from the Lunar surface to the Earth, and I learned to solve the high temperature materials and low mass problems. I think it was the first idea of a 100% clean, ecological nuclear energy. At least the Definition of Ecological Nuclear Energy was my invention: Any nuclear plant on the Moon, whatever radioactive and dangerous it is, is by definition 100% clean and ecological, because it’s impossible that it harms the terrestrial biosphere. An extension of the liquid core Uranium reactors on the Moon was my first idea of a fusion reactor: you could overheat the liquid core reactors until the core vaporizes and heating the Uranium gas further to a Uranium plasma, then releasing this plasma into a magnet bottle, a magnet field created by some coils (German: Spule) on the Lunar surface, and further letting it heat up to some million degrees Celsius. Then Deuterium and Helium-3 would have been added to the hot plasma and would have fusioned. This may have worked, because the ignition of the plasma was thermonuclear and so there was more than enough heat. Because of the high mass of the Uranium plasma and the low mass of the fusion fuel plasma it would have been no bigger problem to separate them by rotation. Radiation-convection heat exchangers in some distance to the hot plasma would have produced the electric power. The magnet bottle would have been adjustable by railroads on which the coils could move along. At full operation the magnet bottle would have been some hundred meters long and wide, to take advantage of the whale effect: the fraction of the surface to the volume of a body decreases with increasing the volume. This is why whales do not freeze to death in the arctic ocean an this is actually why the plasma in this fusion reactors would hold it’s very hot working temperature. In fact, you would have seen these fusion reactors as faint points of light at new moon on the lunar surface – like stars. Of course, it is only possible to build a fusion reactor with such a huge magnet bottle in the high vacuum of the Lunar surface, where you don’t need a vacuum chamber. Also, the highly radioactive Uranium plasma, needed for ignition, wouldn’t be a deadly danger only on the Moon. One reason – but not the main reason – why I stopped my considerations about these kind of fusion reactors was, that I didn’t find a way to separate burned and fresh fusion fuel. The Tokamak fusion scientists have surely the same problems with igniting the plasma, retaining the high plasma temperature and separating the fuel from the burn-up. I never told other engineers about both of my Lunar reactor ideas, yet. The main reason why I think that both reactors didn’t make sense was actually because I never found a solution for the heat problem: to cool the power transformers on one side deep enough that the degree of efficiency, at least the Carnot cycle efficiency, enters an economical ineresting level. Without economic value, these ecological Lunar nuclear technologies were not further interesting to me. I had the self-imposed demand on it, that it should be one of the most cheapest electrical energy sources ever. Otherwise such a high effort to bring machines and constructions to the the Moon wouldn’t make sense. This is still my opinion. When I tried to merge these three ideas one day, and heared accidentally at the same time the mentioned sentence that Arthur Clarke said in a BBC television interview, the famous light bulb appeared: Eureca! Finally I had an idea to a solution of a Fusion Energy plant buildable at present. The one I was looking for, for a long time, buildable with available parts, producing lots of energy. Any part uses at the very most todays technologies but mostly older technologies. That means: any component is well proven. So, it will surely work if someone decides to build it. Here it comes. On the Moon in the northern or southern polar region in the middle of a crater there is a rectangular building. In this building there are three big steam turbines running. These steam turbines get their hot steam alternatetely from one of four artificial caverns in the underground. The mechanical rotational power of the turbines is transmitted to generators that turn it into electric power. The power is transmited by an overhead contact wire to a site of hundreds of Hertzian dipoles on the rim of the crater. Here the electric power is transformed by power electronics to a microwave of high beam power. Across a region of cornfields in the near of a big city, there is an array of dipole antennas similar to that on the Moon. The slim poles with the dipole antennas on the top are standing directly within the fields. The link between orbit and Earth works on a different frequency than the Moon link. It has a frequency that has a minimum loss by clouds and rain. Because of their different wavelengths, the two frequencies crossing at the relay station can not interfere with each other. The cornfield array is directly connected via power masts to the power distribution stations of the nearby city. In the underground are four big caverns. Each cavern has a water supply. This water supply is a lake on the bottom of an almost spherical cave of some hundred meters of diameter. The cave is several hundred meters beneath the Lunar surface. A cyclic process starts. Sphere number 1 is ignited, during some seconds all water of the big lake in the cave is vapour of some hundreds of bars. This water vapour has an outlet that pipes it up to the surface by pressure, then through a distributor, through the three big steam turbines, back beneath the Lunar surface on the back side of the turbines, and finally to the spherical cavern number 3, that is opposite of Sphere 1. The qantity of hot steam of one sphere is enough for about five months. At the end of this time sphere number 2 has been prepared for ignition. Then sphere 2 is ignited next, the water in this spherical cavern is vaporized whilst some seconds, builds a high pressure level, and the steam flows through the same turbines, but now back to sphere number 4. The steam turbines run uninterrupted, the steam distributor in the turbine building just toggled from inlet 1 to inlet 2 and from outlet 3 to outlet 4. The period of energy production by overheated steam lasts again for the next five months. In this time sphere 1 has cooled down and its pressure has been leveled to the pressure of sphere number 3. Sphere 1 is now nearly empty and sphere 3 contains a big water lake. Sphere number 3 – full of water – is ignited, builds up pressure, and is drained trough the turbines to the almost empty sphere 1, which is now refilling with condensing water from the turbines. Five months later sphere 4 is ignited and sphere 2 is refilled. After twenty months the complete process starts again. This process is cycled as long as the turbines can stand their continuous operation in vacuum – lets say thirty cycles or 50 years. The water is allways in a closed process and there is no loss of it. This is very important. First, water is very valuable on the Lunar surface. Second, the water is getting more and more radioactive with time. The three turbines run without interruption over years as long they do not need maintenance. The problem is now: How can we vapourize so much liquid water with one ignition that it will suffice five months a power of one Gigawatt on Earth? Let’s say as an assumption we have to provide about 3 Gigawatts on average to make 1 Gigawatts available on Earth. After 5 months or 13 Million seconds it is 3.9 x 10^16 Joule. This means we have to vapourize and overheat a huge amount of water. If we want to provide this energy by TNT explosive we need about 9000 kT (one thousand tons of TNT or one kT is 4.2 x 10^12 J). 9 Million tonnes explosives are impossible to carry to the Moon. But there is a solution for that problem: we take a thermonuclear detonator – a hydrogen bomb. The U.S. B53-Y2 (clean) warhead had this yield for example [15a], it was build 340 times and was retired in 2011 [15b]. At it’s size it should have about 97% fusion energy of the total energy released. There was a former (dirty) version with a U-238 encasing (Y1) which produced only 55% fusion energy. The nuclear device without body weighs 2800 kilograms and costs some million dollars. The cost to bring one detonator to the Moon may be proportionately 140 Million dollars each, the production cost included. This 140 Mio $ is then exactly the cost of one Gigawatt electrical power on Earth in 5 months. It means that the electrical energy will cost 4 Cents per kWh. And in fact the electric power gets even cheaper as we can enlarge the spherical caves and the thermonuclear devices. In the motorcar any of the four strokes lasts 10 ms at 3000 rpm (the four strokes need two revolutions of the crankshaft). In the Four Stroke Thermonuclear Motor it is 1 week, 30 seconds, 22 weeks and 21 weeks. This is 15 weeks in average and 900 Million times longer than in the motorcar. A motorcar has a typical cylinder volume of 500 ml at 25 kW per cylinder with hot air as working medium at 10 bar. The equivalent typical Four Stroke Thermonuclear Motor sphere volume for 3 GW with steam as working medium at 500 bar is in the 500 Million m³ size that corresponds to 1000 m cross-section dimension – just to visualize the giant dimensions. What I have just explained in this text is a 4 Spheres Four Stroke Thermonuclear Motor. It is also possible to build a 6 Spheres Motor or a 8 Spheres Motor, also 10, 12 and so on. But a 2 Spheres variant is not possible (it would work only 50% of the time) and uneven numbers of spheres are also not possible. First you can’t build such a simple nuclear fusion plant on Earth. It is much to dangerous, if something goes wrong. For example untight plumbing during operation could release big amounts of highly radioactive steam of several hundred bars into the biosphere. Uncorrect calculations before building could result in major earthquakes. Terrorists could steal a bomb that was just made ready for the next ignition stage. This would be a global catastrophe. There is only one place where it can be build and operated safely: on the Moon. But how to get the power from the Moon to the surface of the Earth? This is what I’ve just explained, it is by microwave radio connections. They have relatively low energy losses over large distances and are well known, well proven technology. You may ask now: I know that microwave is well proven technology, I use it every day in my mobile phone. But it’s a low power data connection and absolutely no power connection (hopefully). Is it also possible to transport high power with microwave? There is one good example: Your microwave oven does this every time You use it. And there would be not much more loss of energy, if it would send bundled waves thousands of meters or even thousands of kilometers (if Your focusing antenna would have the appropriate mechanical accuracy). Because of that Your microwave oven does not focus the waves, has a Faraday cage and stops immediately if it is opened. Otherwise it would be a very dangerous kitchen utensil. O.k. this could work, even today, You may say now. But how to build such a huge fusion energy plant on the Moon? Isn’t it impossible? When you start building the Four Stroke Thermonuclear Motor you have to bring some equipment to the Lunar surface first. Therefor you need big rockets. But they have been build, e.g. the American Saturn V  or the Russian Energia , and so they can be build again, even much bigger like the Nova studies showed . There is only one limitation of lift-off mass: if rockets become as heavy as mountains they start sinking in the ground like mountains do. But then we talk about devices a thousand times bigger than the Saturn V. I have mentioned this just to show that we have much space to the upper limits. We need much smaller rockets. 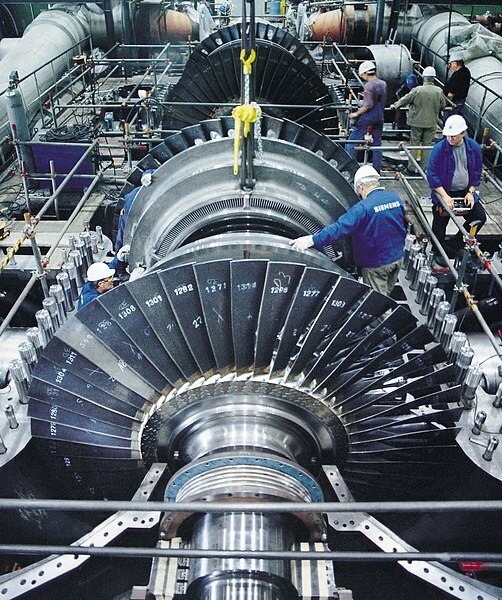 Our heaviest devices are the steam turbines. If we can get them to the Lunar surface, the rest will also fit. But how to dig these huge spherical caves? Don’t you need thousands of miners for it? The astonishing answer is: No, not a single miner! We dig the mine shafts by the means of molten Uranium. This is what some leaking lava from the Chernobyl reactor core actually did during the reactors melt-down . It fell through the stories of the reactor building while melting and vaporizing steel and concrete (China Syndrome). Today it lies on the lowest level of the building. The Chernobyl lava dug it’s way extremely slow, of course, because it was polluted by other molten parts of the destroyed reactor and particularly it was cooled all the time to prevent a melt-through into the ground beneath the building. Chernobyl firemen are still trying to stop the lava 26 years after the melt-down! We will, of course, rather accelerate our molten Uranium than stopping it. We will build a special Wolfram pot to prevent fast mixing of Moon Regolith [18a] lava with molten Uranium and to be able to remove the lava periodically by a kind of bucket at a cable winch. Parts of the molten and solidified lava thereby stabilizes the shaft walls. This drilling device works internally similar to one of my former liquid core reactor designs, but even hotter. You can calculate the exact amount of Uranium that produces the thermal energy you need for a certain depth by the calculation of the heat to melt the cubic meters of regolith and stone to reach the intended deepness. The escaping radioactive gas from the molten lava doesn’t matter. On the Earth we would have a nuclear disaster now, the athmosphere would distribute the nuclear fallout all over the planet and the oceans as well as underground water would do the rest. On the Moon nothing happens but a local contamination. We do this Uranium digging four times to get four mine shafts several hundred meters deep. Into this mine shafts we lower thermonuclear bombs, much bigger than whom we will use later for heating the steam, by wire ropes and ignite them. So we get the spherical caves of several hundred meters diameter during seconds. The caves have to be deep enough, that they do not collapse. For a spherical cave with 1000 m diameter we need a 46 MT three stage hydrogen bomb, for example. The caves roof has to have a minimum depth of 790 m beneath the surface. But we have to go deeper because of the high pressure in our caves during the later operation. Because of our heat driven tunneling machines we use to build the mine shaft, this should not be a big problem for us. Handling with giant caves beneath the surface by means of nuclear bombs is a tested technology   used by nations that perform nuclear underground tests . First I was thinking, I have become mad, planning to blast giant holes into the lunar crust by nuclear means, and to transform it locally to a kind of swiss cheese. But then I read that scientists have found giant natural caves beneath the lunar surface that have been formed by similar energy releases in former times . The Moon crust seems to be a swiss cheese already. Blasting holes into the Moon crust isn’t a crazy idea. It’s an ambitious one, but it certainly isn’t crazy. Maybe it’s also possible to additionally use some of the deeper natural caves for fusion plants. So, please read the rest of my explanations regarding the technology of blasting targeted spherical caves into the lunar crust. 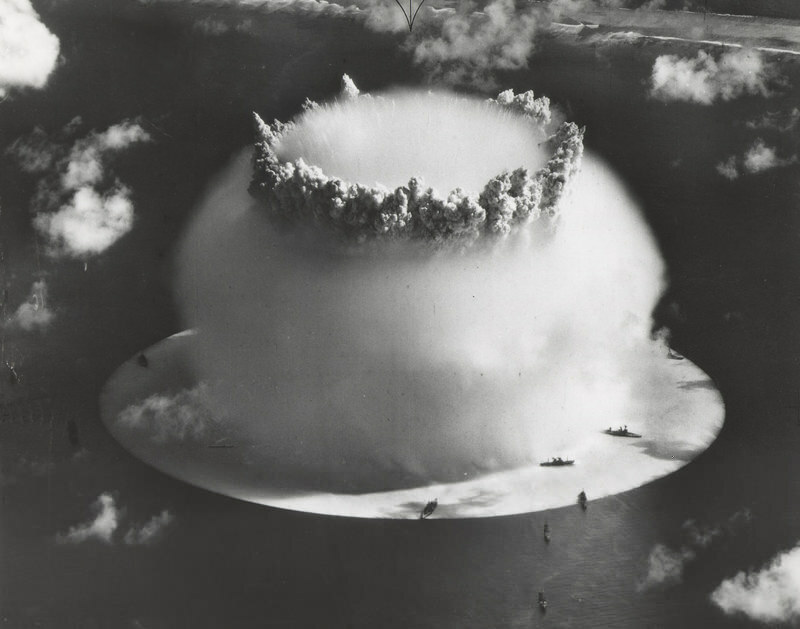 We are talking about detonations beneath the surface, resulting from hydrogen bombs of the size of the biggest explosions ever and even bigger. Will they not cause catastrophic earthquakes? In fact, on Earth there would be a remaining risk that such a big explosion could trigger the movement of tectonical plates, that were under tension. But the Moon is a tectonically still body. It does not have tectonic plates, that are rubbing on each other, at all, and so no major accumulating tensions that could be released. The seismic activity is very low, as the Apollo seismic sensors showed for several years. So the only seismic oscillation on the surface would be that of the mere explosions while building the caves. But the stones are damping explosion waves and it can be calculated exactly how deep the explosion has to occur, that the seismic activity on the surface above the explosion remains moderate. And depth is no bigger problem for our drilling devices, as I showed before. On the Moon the chimney and debris of the cave is not such a big problem. Today we know quite good how the Moon is made up of. Beneath a severel meters thick layer of Regolith [18a] is a crust of 50 km to 150km thickness made up of Anorthosite [18b], a stone very similar to Granite. From several nuclear cave blasting experiments with Granite on Earth we know empirical coefficients of Granite . Because of the known gravity constant, the high homogenity of the Moon crust and a similarity between Anorthosite and Granite, we can apply this empirical coefficients to calculate that our caves on the Moon will have chimneys of approximately 55° to 58° slope that means that the roof will still remain relatively flat and the pile of debris on the caves ground will remain small in any case. Lunar reconnaissance has found big caves just below the lunar surface . Scientists think they are actually lava tubes. It seems that only the parts of the lava tubes that are just beneath the surface have a collapsed roof. This can be simply explained with the chimney slope of Anorthosite at Moon gravity. Otherwise deeper parts of the caves should have been collapsed too. I interpret those Moon caves as a nature-given proof that blasting self-supporting stable spherical caves in lower depths will work as theory states. From a statics point of view Anorthosite at Moon gravity seems to behave as least as good as Salt in Earth gravity. What happened to the mine shafts? While building the spherical caverns, the lower parts of the mine shafts have been destroyed by the explosions, of course. We dig them again, because we will need them every 20 months as access tunnels to install a fusion device into each sphere. We install a five-stage access lock inside the mining shaft that we will not loose any of the precious pressure in the caverns uncontrolled, but get the nuclear devices through it. One lock chamber contains a wire winch for lowering the bombs. Then we install a drilling rig and drill pipes to the spheres from the central area of the crater, where we will build our steam turbine building, later. Now we drill holes to the underground layers of frozen water ice. We melt this ice by means of nuclear heat and fill our caverns with water lakes. This is the reason why we build our plant in the polar regions of the Moon, here the Moon has frozen underground water. Probes have found millions of tons of water ice on the Moon. This has been verified meanwhile  . Then we build our steam turbine house from Moon concrete, that we get from Moon soil with water and cement. The building has big side openings and contains no athmosphere, it is build mainly for providing a solid base for the big steam turbines and to protect them from sunlight and smaller meteorites. After the turbine building is finished and ready for installing the equipment, we get the steam turbines delivered from Earth and start to install them and to build all the plumbings in the turbine building. The first bomb is installed just below the surface of the water lake in sphere number one. Such an installation damps the detonation very well, that you will feel next to nothing standing on the surface while ignition . The first cycle starts and provides at least one Gigawatt electrical power for a big city on the Earth for the coming 5 months. Sphere number 2 is ignited after 5 months and so on. The whole cycle for the four spheres is 20 months, after 30 cycles or 50 years the plant is completely refurbished and gets new turbines or is put out of service. The cost to develop and build the Four Stroke Thermonuclear Motor will be a percental fraction of the Earth based fusion energy approaches, though it is based on the Moon and this might sound very expensive, first. It is actually a very simple, rather primitive process-heat machine. The investment is save, because it works. There is no reason why it should not work. We have validated that there are million of tons of water ice at the poles but the exact locations of the ice and how to convey it is still uncertain . This should be clarified first to be sure where to build the power plants and how to convey the water best by means of nuclear heat. The total cost is about what it costs to buy the material and machines and to bring it to the Moon. Let’s say one-time 22 Billion Dollars, or 5 Cents per kWh in 50 years operating life. But think about the new private rocket companies like Space-X  or Orbital  and their followers, that have begun to provide cheap space access technologies. When we think about the great successes of Space-X during the last view years, it’s absolutely believable that they could build us a big cheap launcher to carry 200 tons to the Lunar surface to bring our steam turbines to the building sites. This could further reduce the cost of the building of the plant, that mainly consists of transportation cost. It may sound odd for people who think space and Moon things have to be the most expensive things in the world, but this kind of thermonuclear motors would be quite cheaper than offshore oil production or offshore wind power. This is actually the main reason, why I decided to publish the thermonuclear motor, and why I never published for example my Moon based liquid core reactors. The liquid Uranium core reactors seemed to be more expensive than wind power on earth, so there was no reason for ever building them. With fusion energy anything changes now. The total cost effectiveness of the Four Stroke Thermonuclear Motor depends only on size. If the first design seems not to be cost effective, You engineers will design the underground spheres bigger and You will allways get to a very cost effective design, actually to a very cheap solution. 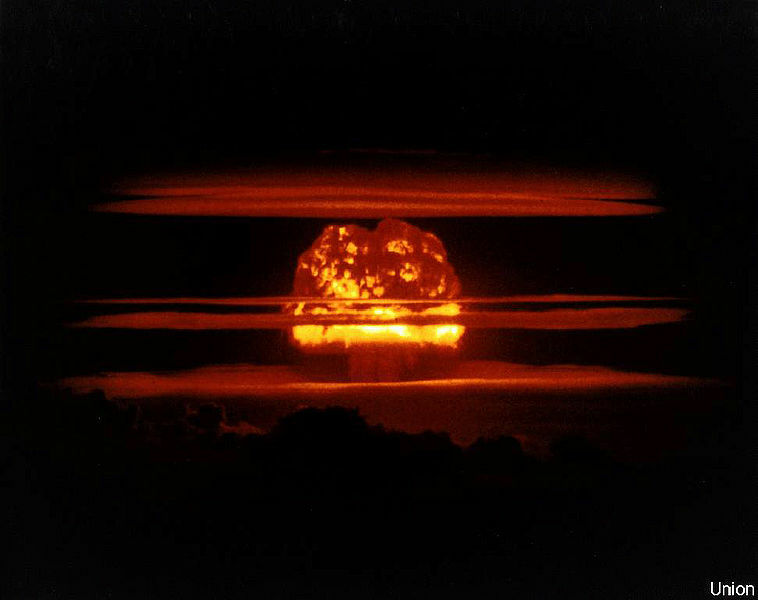 The cost to enlarge a thermonuclear motor grows approximately by a square-root function, because it actually depends merely on the amount of Deuterium used in the hydrogen bomb, that blasts the underground caverns. There is no building or structure at all to raise for the pressure vessels. So the plant is getting not much more expensive when it is further enlarged. Finally you will certainly get to the cheapest electric power provision ever. As I mentioned in the introduction, I never published my ideas of liquid core Uranium fission reactors as well as the huge-free-magnet-bottle fusion reactors, because of their insufficient degree of Carnot cycle efficiency. The fusion reactors didn’t work so far, theoretically, because of the burned-fuel-separation problem, but the liquid core fission reactors did. However, this method of producing energy seemed to be more expensive than off-shore wind turbines on earth and therefor didn’t make sense. To alter the liquid core reactors to an effective means of power production, one had to flange gigantic heat radiators that were able to bring the temperatures down at one side of the power transformers to an acceptable degree. This actually had it’s origin in the continuous operation of the reactors. I didn’t find a way to give them time to cool down in between without jeopardizing the complete nuclear liquid core stability (or collapsing the fusion plasma, if the fusion reactor would have been an option). But with huge radiators they wouldn’t have been truly cheap anymore, because you had to bring all these masses up to the Moon. The Four Stroke Thermonuclear Motor doesn’t have this problems. After the usable fraction of the process heat was used to run the turbines 5 months during stroke number 3, the bigger fraction of unusable heat has 5 months time to cool down passively whilst stroke number 4 and stroke number 1. During this time you have the chance to use several methods to boost the cooldown like expanding and condensing, radiation cooling, heat pumps, etc. And if this means is not enough for reaching the desired temperature level, or it is getting expensive, then you will simply enlarge the motor from a 4 spheres to a 6 spheres motor. So you have doubled the time for cooldown from 5 months to 10 months. What I want to say: you will allways achieve a design that provides a suitable degree of energy efficiency. This is an intrinsic and unique feature of the Four Stroke Thermonuclear Motor and has it’s origin in the non-continuous approach and the arrangement of several spheres correspondent to the cylinders of a combustion motor. I mentioned the losses. The most interesting losses are from the dipoles on Earth to the Earth facing relay satellite, between the two sattelites, from the Moon facing sattelite to the dipole site on the Moon, and from the turbines to the underground caverns. I was also talking about the phenomenon of lower increasing cost with increasing size of the plant. This means, whatever high the losses might be, you can allways dimension the spheres as big, that you achieve the intended low cost for the electric power on Earth. This results from building beneath the Lunar surface and the building practices. Deep beneath the Lunar surface giant plant size and huge energy release doesn’t matter at all. It seems that the power plant depends on the availability of water ice for producing steam. This is not so. You can take any available gas, it has not neccesarily to be steam. Steam has the highest heat capacity coefficient, that is why it would be the best solution, but not the only solution. Otherwise the spheres would become again bigger, but as I explained several times before, this is actually no big problem on the Moon. There is only one limit for increasing the size of the spheres: the geologic limitation, the Moon crust is between 50 km and 150 km thick. If you allow to blast holes in it of a maximum of 20% demolition, than it is 10 km and 30 km diameter, respectively. We were talking about 1 km diameter so far. But even if you once decide not to use bigger spheres and bigger explosions than a certain limit you define: in case, just build two spheres in place of one. In my opinion a non-continuous-fusion energy plant like the Four Stroke Thermonuclear Motor is entirely realistic and todays usual continuous fusion concepts are not, although they are built. But this is actually why we design our research reactors on Earth: to test the hypotheses about plasma and fusion. They are so far away from producing energy and even more far from producing huge amounts of thermal energy for operating gigantic turbines like any true electric power plant does and as well the four stroke thermonuclear motor will do. I think, the Four Stroke Thermonuclear Motor is not only coincidentally the first buildable fusion plant and is not just one of several possible paths to fusion power. The more I think about it, it becomes clear to me, that this and similar Lunar non-continuous thermonuclear fusion power plants, will be the only solution to get widely used cheap and clean fusion power for centuries. I’m not saying this, because it’s my idea. Read T. H. Rider’s dissertation  and think about it. Think about the three problems that I mentioned in my introduction: Ignition, Heat Loss, Separation. 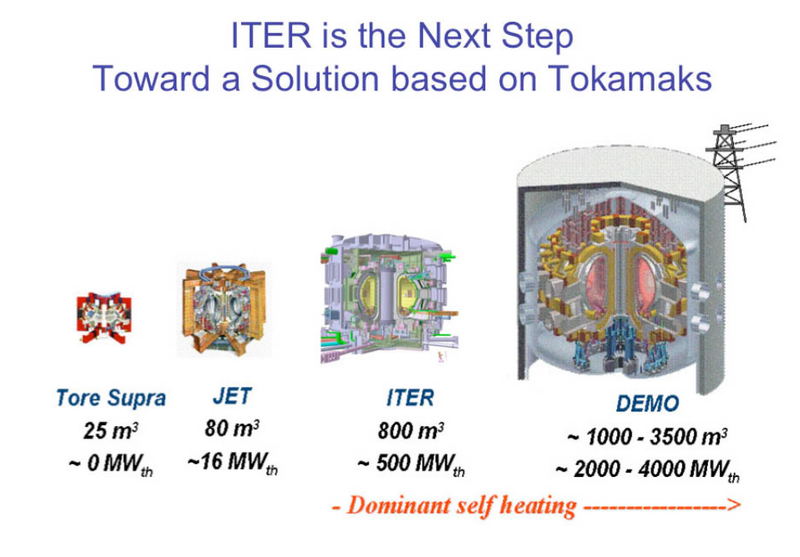 The Tokamak  reactor ITER  is much too small and will never deliver usable energy, there is no doubt, even if they could find a solution for the ignition and separation problems. The cost of Tokamak reactors approximately grows cubically with size. We would need at least many decades to build single Trillion Dollar super-high-tech Tokamak reactors of pyramid size on Earth, for each. But the even much bigger spherical underground caverns of the 22 Billion Dollar low-tech (and low cost, relatively) thermonuclear motors on the Moon are built in just some weeks essentially by four nuclear strokes of some seconds. Hence, you can build many of them in parallel with the same infrastructure. The cost to enlarge them grows by a square-root function, so they are getting not much more expensive when they are further enlarged. And they can be build now. To use thermonuclear bombs as steam generators seems crazy at first view. But they are ignited in deep underground on the Moon and do not harm or destroy anything. No human can ever hear them, see them or feel their heat. They work just like the deeply embedded explosions in a motorcar, but in contrast without any noise. Our whole fusion power plant works actually like a four stroke motor, only many, many times bigger and slower. It’s not a reactor, it’s a process-heat machine, a steam machine, the actual fusion reactors are the well-proven thermonuclear 3-stage hydrogen bombs, that produce about 97% of their energy by nuclear fusion. Our machine is no danger to anyone, because it can only be build on a completely dead and uninhabited celestial body like the Moon. If someone attempts to adapt it to Earth he must fail, because the complete fusion power plant will become about a hundred times more expensive than on the Moon. Earth has a six times higher gravity than the Moon that makes the underground caverns very unstable, he has to reinforce them. Today no one knows how to do this, but even if there was a way, it would be extremely expensive, because of the huge size of the reinforcing structures. He has to add hundreds of fully redundant safety and security systems to prevent radioactivity from escaping and killing residents, he has to add gigantic staged heat exchangers, early-warning systems, air crash safeness, he has to prevent the triggering of earthquakes by the plant, etc. But he could do what he want, the plant would allways remain very dangerous to humanity when built on Earth. It is a Moon machine, never intended for planet Earth. Above all it produces extremely cheap electric energy for Moon industries. But it also provides huge amounts of clean, fail-save, fool-safe and surprisingly cheap energy for the use on Earth, if we want it to. The cost of the electric energy depends merely on the scalable size of this plants and will underprize any of Earths energy sources, if big enough. Apart from a certain energy independency, power plants on Earth will not make sense any longer. As I explained before, you can switch the power delivery off and on whenever you want. It is the first 100% clean and ecological nuclear plant from the biosphere point of view – the only view that makes sense. But it even pollutes the dead Moon insignificantly during building and operations. It is the first fusion power plant at all, buildable today with existing technologies, and presumably the only buildable fusion power plant for centuries. The realization of the dream of producing large quantities of clean, safe, affordable, and essentially limitless power for all mankind on planet Earth is within grasp now. This article has presented the proposal for new fusion power plants made exclusive of existing technology, how they work and how they are built in detail and that they work. The latter was proven by means of basically thermodynamic considerations. Also, the text has proven the safety and ecologic cleanness of the plants. It has shown in detail how to build them economically, of course by apparently unusual and violent means, and it takes some getting used to. The electric energy they deliver on Earth will be cheaper than any form of electric energy before, although they are built on the Moon. In this case it is because they are built on the Moon. The article has shown that they can be built even much bigger, assuming a square-root function of cost. This means the cost for electric power further decreases significantly as they are enlarged. Enlarging them seems very easy, because most technical and savety problems on Earth do not exist on the Moon. Fusion energy is available. Now it is a question of decision. „Of course: 3GW in, 3GW out at thermal equilibrium. You are right, the system behaves nearly adiabatic and produces at least 100 times more power than the stone absorbs. The stone walls are only able to transport the average 3GWs away until the radius of the temperature front grows up to a maximum of 70m in a 16-cylinder version. But this might be relatively fast. This would mean 120 caves at an operation time of 50 years with 5 months operation time each. The only way to reduce the number of caves is to work with a moderate temperature increase, let’s say three times 250K until the stone walls are nearly melting. This would mean that we had to use 40 caves at 5 months operation time, or 20 caves at 10 months operation time. But then the caves become very big. What does this mean? It means the volumes of the cylinders and the energies to build them will grow by a factor of 80 at a 6-cylinder solution working 50 years with any available gas as fluid but not water (with water it would be 40), and so the diameters of the caves will grow by a factor of 4.3 from 1000m to 4300m. This sounds not so alarming, but the needed energies to build the caves turn out to be very scary at least, I think. Maybe we find natural caves of the appropriate size and depth, and vulcanos provided the Gigatons of thermal power to build them, million years ago. After 50 years operation the plant must cool down for several centuries until it is used again for 50 years. Because, we would switch to other areas in the meantime before we come back, the „swiss cheese moon“ is an adequate expression. I knew, that the plants would become economically interesting as the cheapest energy solution ever at a much bigger size than that I originally calculated, and mentioned that in my text, but I was afraid to handle values of higher Megatons than the biggest man made thermonuclear devices ever for building the caverns. Because I was not aware of the nearly adiabatic behavior of the stone walls that occurs mathematically after a short time of operation, I thought it would work in this way. Other people who have experiences with „a similar problem with ground source heat pumps for HVAC systems in buildings on earth“ know this immediately. I thought it could be build in a „miniature version“ of 1000m diameter with a 46MT blast to build that sphere. This will not work. Now the thermodynamic necessities force me to start with several kilometers cave size. It seems, nature doesn’t consider our fears and our power of imagination. At this moment I’m not able to immagine such size and energy. A 5km diameter spherical cave provides 1,500,000kT * 1,162 GWh/kT = 1,752,000 GWh thermal energy, 876,000GWh electric energy on the moon and 438,000GWh electric energy on earth. A 2-cylinder version is the smallest solution now. It provides 50 years 1GW electric power on average earth and 2GW on the moon with two detonations for building it and one detonation for heating up the water steam. It is also possible to run several pairs of cylinders in an in-line configuration (but not in a star arrangement as in the first version). After the building of the two 5 km spheres, both are immediately vented. Then one of them is filled with (precious) water. The 1500MT detonator is activated to produce steam. This runs the turbines 50 years to produce 1GW for a city on earth or 2GW for moon industries. After 50 years the remaining rest of the water steam is actively pumped from the first to the second vessel. A new, a third vessel is blasted now behind the second vessel. After 50 years the old turbines are off duty. New or refurbished turbines are built between the second and third vessel. A detonator is activated in the second vessel, the hot steam goes from the second to the third vessel. And so on. We build vessel after vessel and the turbines between them any 50 years. We can build several lines in parallel, if we want. There should be at least two, that are staggered, to enable a continuous operation. The lines are not exactly linear, but proceed in a wide circle. After, say 30 vessels or 1500 years, we connect to the first vessels again and close the system. But it can also be 50 vessels in 5000 years or other values, this doesn’t matter, as long it is long enough that the first vessels and the bedrock around them had time to cool down. The only reason for closing the chain of caves is, that we not build caverns forever to get a literally „swiss cheese moon“. We use allways the same water. This is the important detail and connects it to the older idea, that had the intention to reuse precious water in a closed system. The system should be now o.k. from a thermodynamic point of view, because I use the 218K cold bedrock around a new cave as heat sink and long time radiator to release the heat into space. It doesn’t matter if this needs centuries of time. The energy of the thermonuclear detonator sounds really monstrous now. But as it was before, no human being will never see, or hear, or feel the thermal energy, released deeply beneath the lunar surface. There’s one good side effect with that minimum size now: The percentage of uranium fission energy for igniting the deuterium will reduce further, say below 1% of the total energy released. So it becomes now a nearly 100% fusion device, more than any tokamak can ever be, considering the needed energy for ignition. In the older version it was at least 3%. From this point of view, and by recognizing that the number of caves has reduced from at least four caves to only two at the beginning, later allways one cave, the energy should be even cleaner and maybe 3 times cheaper per kWh. The cost per kWh should fall now below 3cents per kWh. This is the effect of size, I mentioned in my proposal. But of course, the energy release seems scary.